The 4th Pongos Helping Pongos Art Event was held at the G Gallery on March 27th, 2010. This very special evening featured over 40 individual paintings done by our orangutans, elephants, siamangs, babirusa and clouded leopards. Another 20 paintings were joint efforts by the animal artist and a human artist. Each painting was professionally framed thanks to our partners at YolArt Fine Arts and accompanied by conservation information and an animal artist biography. The paintings were displayed at G Gallery in the Heights for this one night in a fine arts setting, which included a wine and cheese reception and photographic portraits of the featured artists (but taken by humans). Professional photographs of wild orangutans and Bornean elephants were available for sale thanks to Houston photographer Paul Swen. The 2010 event was a great success. Over 300 people attended, checking out the paintings and photographs, competing in the silent auction bidding, meeting old friends, and walking away with beautiful art by animals and people. This year, approximately $27,000 was raised for the pongos. Proceeds from the paintings, photographs and portraits sold will be donated to the preservation of orangutans in their natural habitats. The benefits of the Pongos Helping Pongos art program are many. It provides Zoo animals an outlet to express their intelligence, personalities, and abilities. It allows them to fulfill their mission as ambassadors for their species. It generates precious funds that support conservation actions on the ground and behavioral enrichment initiatives at the Zoo. At the same time, this program engages the local community, creating a deeper appreciation for the lives of all animals and inspiring a greater concern for their well-being. And all of this is achieved through the exhibition and sale of the animals' own art, an annual event that we call Pongos Helping Pongos. Pongo is the scientific name for orangutans, so this translates as Orangutans Helping Orangutans. Since 2004, Pongos Helping Pongos has raised over $100,000 for the Kinabatangan Orangutan Conservation Project and Elephant Conservation Program in Sukau, Sabah, Malaysia and $20,000 in support of field conservation efforts at the Gunung Palung National Park in Indonesia. Both projects are located on the island of Borneo and represent some of the last remaining habitats for wild orangutans. 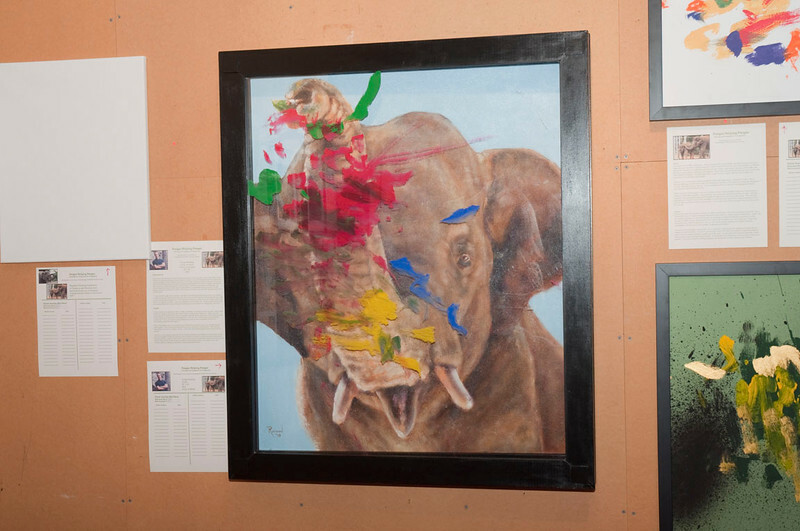 In addition, a portion of the annual art sales are applied toward orangutan behavioral enrichment projects at the Houston Zoo. The Houston Zoo is proud to be a partner of the Kinabatangan Orangutan Conservation Program, supporting research, education, and awareness programs for orangutans, elephants, and habitat protection in the region.